The Keo 2 Max is the next generation of Look's popular Keo Sprint. Optimized for better power transfer, stability and the prevention of hot spots. In this updated version, Look has gone to great lengths to ensure durability. I've been using these pedals for over 5 years and have never been disappointed. They are sturdy, lightweight and provide the flexibility of tightening or loosening the tension as needed. Light, smooth, and they work. These are very nice pedals. They are very compact, but offer good support. Very smooth and excellent cornering angle. Only slightly harder to get into than the old-school Look pedals, but you get used to them quickly. Have had these for a while and by far some of the easiest pedals to use. Very solid, no noises at all. Even at the lowest setting haven't had any issues unclipping. And that's from spinning 110 cadence to hardergrinding lower cadences. If they don't always sit vertical (1-2pm), give them a few rides, this was the case with mine. Cleat wear is okay. Commuting doesn't help with the stop and go. Look KEO 2 Max Pedals are the BEST! I've ridden many miles with the other brand of pedals, but the Look KEO pedals are the best. They spin easier than other brands so smooth right out of the box. The cleats with the teflon piece in back really make getting out when you want to a sure thing. I've gone down more than once because the other pedals hung up and could not get out. These KEO cleats are securely held in when I'm riding hard and can still get out when I want or need to. These KEO 2 MAX pedals have a larger spindle to hold up to my size and 200mm cranks on my new bike!! Nice addition to my bike they look great and are very smooth! I put these on my aluminum fender'd up commuter bike! Made the ride more comfortable. Wore out a set of Keo classics so I decided to get these. After a few rides, I really like them. They are slightly wider than the Classic, which I thought would be bulky. However, I was pleasantly surprised. I got these pedals for my new TT bike and have been very pleased with them. No issues clipping in or out of them except on very rare occasion. For a fast TT transition you'll still need to do something to get them more even for fast clip-ins (ruber bands or something), but that's the case with pretty much any pedal like this. Very good quality, correct weight, and very nice look. Solid performance with a super price. 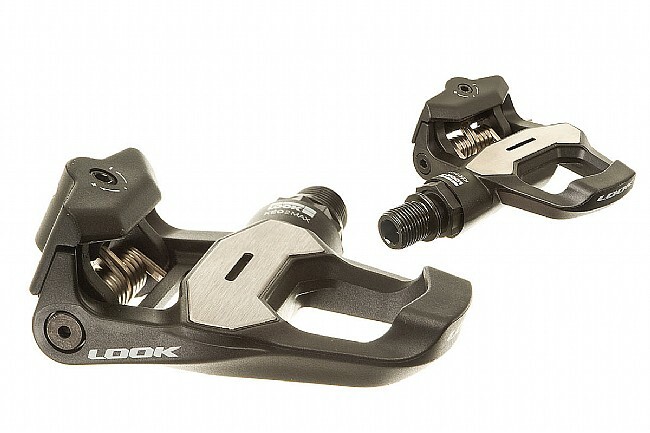 I have used Look pedals on several bikes for seven years and have found them to be the best combination of weight, price and ease of use. My recent purchase of the Keo 2 Max in white worked perfectly with my recent build of a white Ridley Damocles. I run the red cleats for maximum float and no knee pain. For the few grams extra in these pedals over the carbon, I would recommend these every time. The Look Keo 2 Max Pedals are easy to clip in and out. I purchased these pedals on sale and they are a great pedals for under 100.00. I would suggest buying the black as the white pedals don't look as good after a few rides the pedals start to look dirty. Easy installation, secure lock in and simple technology make this my product of choice. Awesome pedals are my new favorite. I love these pedals. I've converted all of my bikes over to the LOOK Keo platform, but these are on my best bike. Stable and light, I pedal with complete confidence. I've always been a Look user and these don't disappoint. Fairly light plus the wider platform can't be beat. Light, easy to install and adjust, big upgrade from my Shimanos. Love 'em, and a great deal. If you have a bunch of bikes, the Keo 2 max is perfect as they are affordable, they are easy to use, they are secure, plenty light and they last many years. Keep you cleats fresh and you will not experience any play. Use Look KeO pedals on both bikes so as to not have compatibility issues with shoes, cleats, and cleat covers. I decided to stay with the original non-blade version due to familiarity and a belief the non-blades orient better for clip-in. So far I have been very pleased with this new set which replaced a KeO pair with 43,000 miles. I also like the tension adjustability feature rather than one preset tension. Good pedal. Works for all level of rider, from casual to racer. Positive engagement, clean disengagement. As with all Look road pedals, though, cleat wear is an issue. It's hard to beat the price point. However, the clipless retainer plate wears rapidly, which is why this is my third set,of Look pedals in 4 years. The wear is especially bad if you ride in the rain or on dirty roads and dismount occasionaly. I ride Time, Shimano and the Look. The each have thier quirks but nothing is perfect for every rider. I have the carbon spring version of Time and i see Look is pushing their version. However, with look you have to buy complete new carbon blades to change retention strenghth. With Time you have three adjustments with one carbon plate. Spring or carbon blade? They serve the same funtion, but the spring version is a lot cheaper.